With one game to decide the OIBA championship, the Clackamas Hammers handed the baseball to right-hander Kaiden Miller. Miller went the distance, scattering eight hits with one walk and eight strikeouts Saturday, helping lift the Hammers to a 5-3 come-from-behind win over the Grant Generals at Lake Oswego High School. 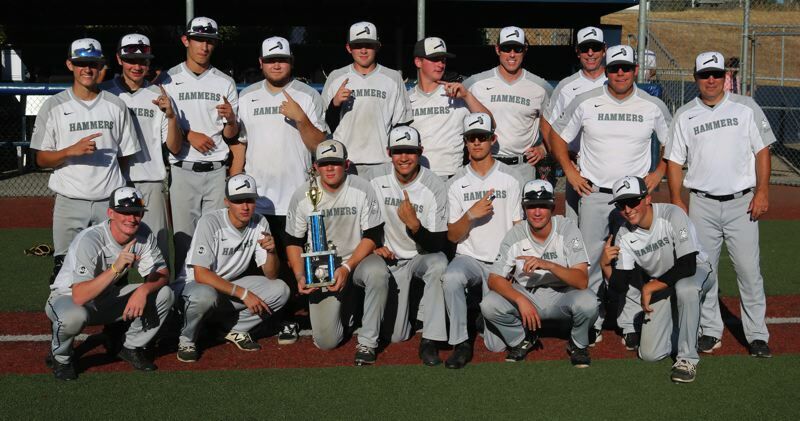 Jack Dollen went 2 for 3 with a pivotal two-run double in a three-run third inning, Brody Upton added a solo homer in the sixth, and Miller and the Clackamas defense took care of the rest as the Hammers clinched their second Oregon Independent Baseball Association title in three seasons. "I thought Kaiden was outstanding," Clackamas coach John Arntson said. "He had command of all of his pitches, but I think what really stood out to me was his poise. "I mean, he was very calm and collected and just went about his business. It was kind of cool to see a kid who's going to be a sophomore do that." Miller's outing punctuated a string of solid pitching performances -- three consecutive complete-game efforts -- that served as the catalyst to Clackamas' title run in the 12-team, single-elimination tournament. Jeff Nelson set the tone in Friday 6-0 quarterfinal win over Jesuit, firing a two-hitter with one walk and eight strikeouts. Nick Vaughn then took the mound in Saturday morning's 7-2 quarterfinal win over Westview, throwing a three-hitter with two walks and four strikeouts in a rematch of June's Class 6A championship game. Then it was Miller's turn. "We just weren't sure how things would go," Arnston said. "Opening up with Jesuit, that a good program. A good team. I didn't want to be saving Nellie and get sent home on day one. "So, yeah, we did have the rotation set up that way. About a week before, we kind of said, 'Here's how we want to go,' and then set things up that way. And it worked out." Miller said he didn't know until Saturday morning that he'd would be getting the start in the final, assuming, of course, that Clackamas first got past Westview in the semifinals. "I was proud to get the start, proud that they believed in me," Miller said. "I felt pretty good going in. I was excited and thinking, 'I just got to do what I got to do.'" Grant opened the scoring in the third inning, pushing home two runs on consecutive two-out singles by Will Bachman, Spencer Scott, and Cooper Shaw to take a 2-0 lead. Clackamas answered in the bottom half of the third when the Hammers sent seven batters to the plate against Grant relieve Jackson Montfort and scored three runs on two hits, one hit batter, and one Generals' error to take a 3-2 lead. With runners at first and second with one out, Nelson grounded a ball to third that Grant misplayed into an error, allowing Nate Vaughn to score Clackamas' first run. Dollens then drove a 0-2 pitch from Montfort into the gap in left-center field to score Nick Vaughn and Nelson, giving the Hammers the lead. "Anytime somebody scores on us, we want to get the runs back as quick as we can," Dollens said. "I just remember being down 0-2 after missing a drag bunt. Then I got an inside fastball -- my favorite pitch -- and I just drove it to left-center." Clackamas added a run in the fourth when Pierce Kurasz led off with a single to right, went to second of Will Lindholm's sacrifice bunt, advanced to third on Upton's fly out to center, and scored on Nate Vaughn's infield single to second to make it 4-2. Grant got a run back in the sixth when Scott hit a one-out triple and scored on Shaw's grounder to short. The Generals got two more hits in the inning, but left the runners stranded on the corners when Miller got Kenji Lamdin to ground into a 6-4 fielder's choice. Grant's Mike Clark relieved Montfort to start the sixth and retired the first two Clackamas batters he faced before Upton drove a 2-0 pitch from the Generals' right-hander over the fence in left, pushing the lead to 5-3. In the seventh, Miller struck out Clark leading off the inning, then retired Sam Simril on a grounder to shortstop and Jackson Farr on a game-ending grounder to second. "My stuff was working pretty good all day," Miller said. "Grant's hitters are good. That whole lineup was consistent with how they swung the bat the whole game. I just had to go through the order once and find out where they were weak, and then once I got some run support, I felt a lot better." Clackamas (25-4) got offensive contributions throughout the lineup, from Upton in the leadoff spot to Lindholm in the nine hole. "We had guys just grinding out at-bats, finding ways to get on base," Arntson said. "Then we'd bunt a guy over, maybe steal a base, get to third, and then find a way to get him in. "We did that a couple of times in both games today and I brought that up to the kids: 'That's kind of Clackamas baseball. That's who we are and you guys are doing it well right now.'" Grant had a slightly longer path to the final, opening the tournament with a 3-2 win in eight innings over Sunset on Thursday, followed by a 10-6 win over Sherwood in Friday's quarterfinals and a 2-1 win over West Linn in Saturday's other semifinal. "I'm really proud of the group and what they accomplished," Generals coach Matt Kabza said. "Our goal was to 'compete' and 'improve.' Those were the two words we kept coming back to over the course of the summer, and I felt like we got just a little bit better each game, and because of that, we ended up here in the final against Clackamas. "I thought it was a pretty good ball game. There were a couple of opportunities where we could have come up with a defensive play or two and potentially that could have got us out of a couple jams, but … that's baseball." For Clackamas, Arntson was encouraged by the positive strides he saw his team make this summer, especially considering most of the Hammers' success came with third baseman Alex Claxton and outfielder/pitcher Grant Schoen choosing to play club baseball over OIBA ball. The questions for Clackamas now becomes: How much of the Hammers' summer success will carry over to next spring? "For this group of kids to do what they did and build that confidence is absolutely huge four our program," Arntson said. "We can stand there as coaches and say, 'Hey, we're going to compete for a title,' and that's us saying it. But now when they do this, now they're saying, 'Yeah, we are going to compete for a title.' I think that's big." In other OIBA action Saturday, Canby pounded Cleveland 19-5 to win the 10-team Tier II tournament at Gladstone High School, and Gresham overpowered Lake Oswego 12-9 to win the 12-team Futures tournament at Westview High School. CLACKAMAS 7, WESTVIEW 2: Brody Upton went 2 for 3 with a solo homer and an RBI-single, highlighting a five-hit attack that helped carry the Hammers over Westview in Saturday's first of two semifinal games. After Westview scored an unearned run in the first inning, Clackamas answered with two runs in the first, one in the third, and three in the fifth to open a 6-1 lead. CLACKAMAS 6, JESUIT 0: The Hammers broke the game open in the third inning when they sent 11 batters to plate and scored five runs on four hits, two walks, one hit batter, a batter who reached on a dropped third strike, and two Jesuit errors to take a 5-0 lead. LINCOLN 8, OREGON CITY 7 (8): Lincoln's Miles Parkel hit a one-out triple to the gap in left-center field and scored the game-winning run when the relay throw to third skipped past the base and bounced out of play in Thursday's OIBA tourney opener at Lake Oswego High School. Trailing 6-4 in the seventh, Oregon City scored three runs on consecutive two-out hits from Brock Riskey, Micheal Montoya, Conner McCalvert and Hunter Davis to take a 7-6 lead. Lincoln pushed home the tying run when Zach Schwarz grounded into a bases-loaded fielder's choice to force extra innings. CLEVELAND 8, GLADSTONE 5: Cleveland turned four hits, eight walks, and four Gladstone errors in the first four innings into a 7-2 lead and never looked back in Saturday's OIBA Tier II semifinal game at Gladstone High School. Gladstone's Mateo Burgos drew the start, but struggling to find the strike zone as he allowed five runs on three hits with seven walks and three strikeouts in three-plus innings of work. GLADSTONE 7, NEWBERG 5: Matthew Kuhn's two-run single capped a four-run fifth inning that helped rally the Gladiators past the Tigers in Friday's quarterfinals. Trailing 5-3 in the fifth, Gladstone sent nine batters to the plate and scored four runs on three hits, one hit by pitch, and two Newberg errors. Wesley Haverland went the distance on the mound for the Gladiators, allowing five runs (four earned) on nine hits with one walk and three strikeouts.